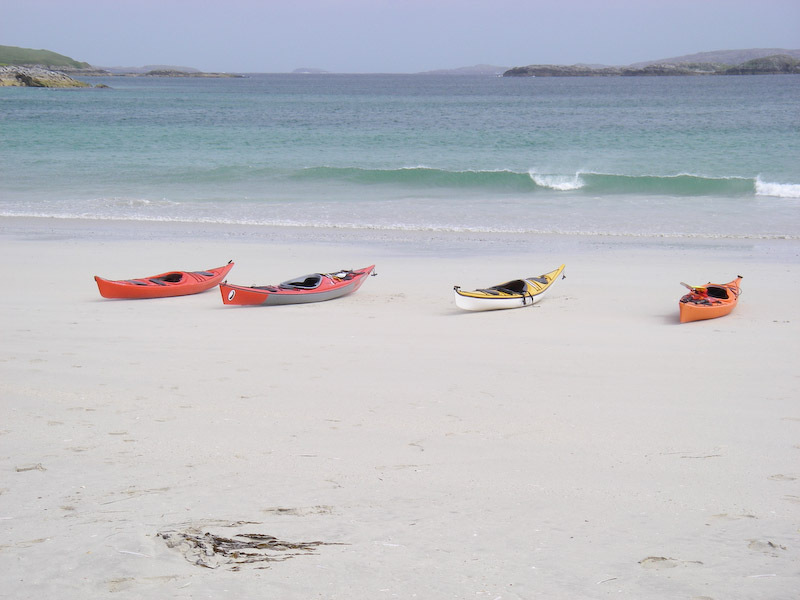 Had an awesome week up in Lewis with the Garnock Canoe Club. Conditions were wild upon our arrival – it’s the first time we’ve set the tent up in a hurricane and could only do so with the assistance of several kind folks who literally pitched in. It was good to learn that our kayaks had remained attached to the car roof as we journeyed from Stornoway up to our campsite at Traigh na Beirigh, Cnip. The day after our arrival was a tourist day as the high winds precluded venturing on to the water. Instead, we explored Uig Bay, the Callanish Standing Stones (pre-dating Stonehenge), the Dun Carloway broch and the Gearrannan Black House Village – all well worth a visit. The next day, we did manage to get out in our boats. For the less experienced kayaker, this should have been a complete non-starter. It was only the presence of 2 senior coaches that allowed us the privilege of experiencing some pretty challenging conditions generated by the Atlantic swells making their way over to the Hebrides. 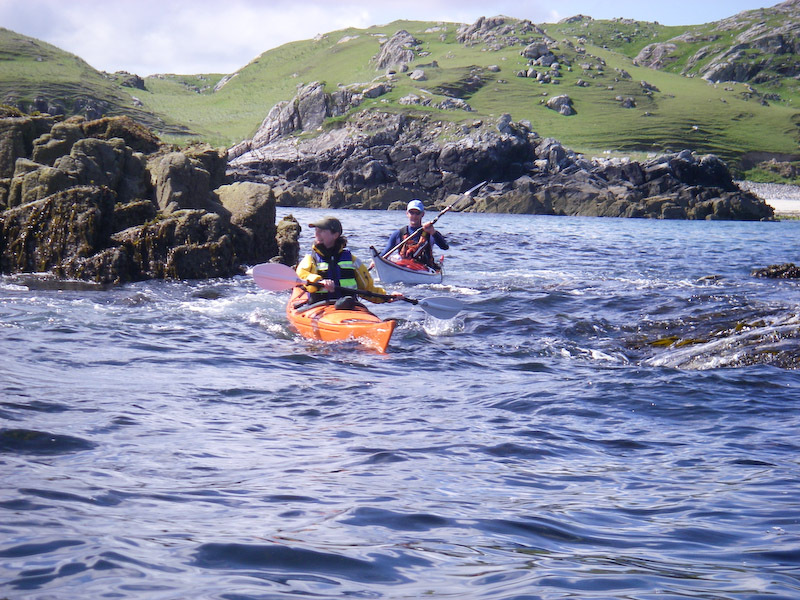 We paddled with Richard Cree of our club, and Mike Sullivan of Stornoway Canoe Club, and their upbeat encouragement and instruction gave us the self-belief needed to tackle the roller-coaster swells and to have a lot of fun in the process. 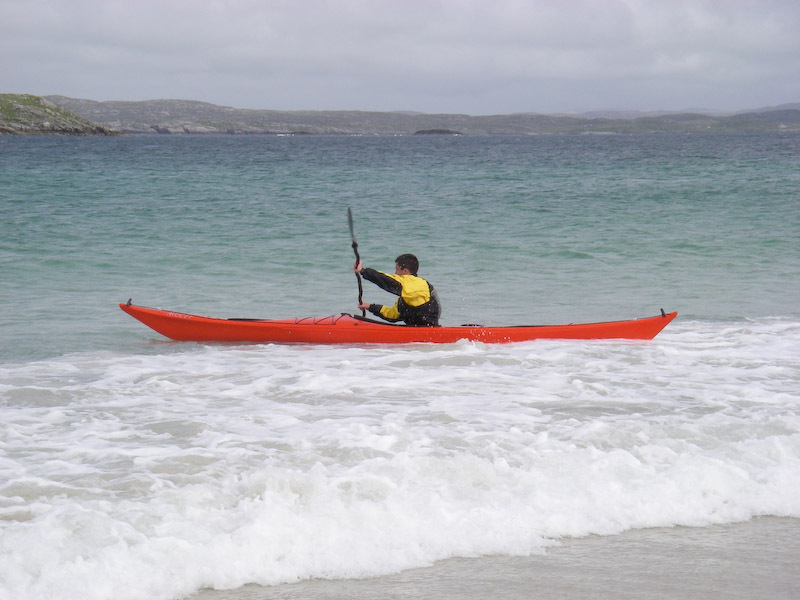 Wednesday saw us paddle north-west from Trigh na Beirigh up the Bhaltos coast before crossing over to Pabaigh Mor and following its coastline south-east. 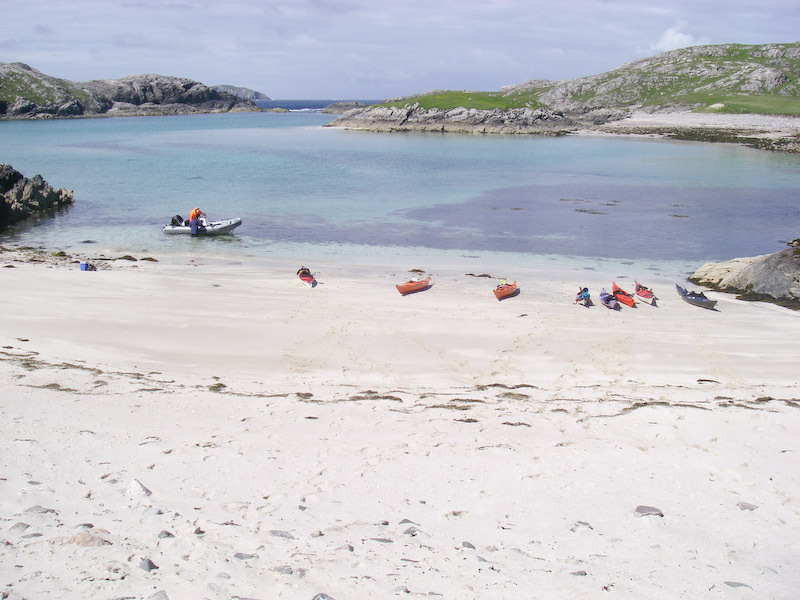 After stopping for lunch on a small beach on Pabaigh, we paddled around Bhacsaigh and then headed back against the wind to our starting point. This was followed by some play in the surf by some of our company. 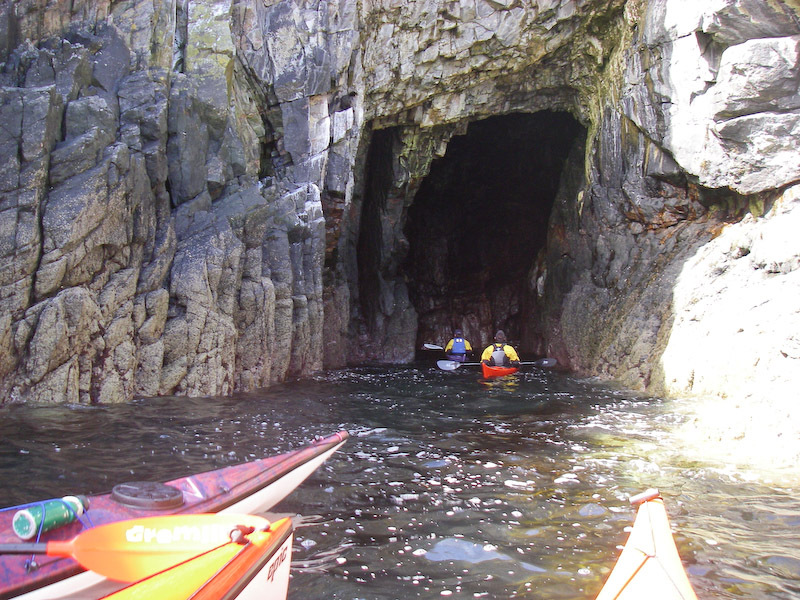 Thursday saw us set out once again from Trigh na Beirigh, heading north to the east coast of Pabaigh Mor and exploring some caves along the way. As we passed between Pabaigh and the little islet of Bogha Dubh, I decided to make a quick visit to the “white room” located there. To my shame, my novice skills were overwhelmed by a substantial wave bouncing off the islet which swiped my boat and sent me off in a sideways detour. I should have, of course, braced into the wave. Failing that, I could have executed a perfect roll back up, or a high brace, or I could have hung around for a short while and then performed an eskimo rescue. Failing all that, I could have flipped my boat and jumped back in swiftly before paddling to safety. Would have, should have, could have. Of course, I am entering the realms of fantasy when I talk about perfect rolls and high braces, but the other options would not have been beyond my capabilities had I managed to engage my brain. Instead, I went for a bit of a swim, but only briefly as, faster than you can say “watery grave”, Richard and Mike were on the case. Mike quickly attached a tow rope to Richard’s boat, whilst Richard was busy emptying and righting my boat, whilst I clung on to Richard’s boat. Safely towed away from the lurking rocks off Pabaigh by Mike, Richard helped me jump back into my boat and we paddled off into the sunset. Or so it seemed. A perfect assisted rescue all round. But that doesn’t make up for my own inadequacies and I have vowed to address these forthwith. The up-side is that this was a sterling test of my new dry suit, which held up impressively and I didn’t feel a thing. Recovering from our recent excitement, we made our way to a beautiful lagoon at Pabaigh where we hopped ashore to enjoy lunch. Mike explained that the lagoon had, in the past, been used to store lobsters before they were shipped to restaurants around the world. It was a beautiful spot and, with the azure waters around the beach in the sunshine, one could think of oneself as being on a tropical island. After a little exploring, we set off again, heading west, then turning south-east through some formidable swell. Only Mike’s exuberant cries of “Fan-tastic!”, and Richard’s declarations of “It’s a beautiful thing!” kept me from contemplating my next wet exit too seriously. We all returned safely and, despite my mishap, I felt pretty buzzed at having at least been out there in some “real” conditions and survived. I was greatly inspired by not only the senior paddlers in our company, but also the hugely competent younger members – I hope to be as good as those guys one day. Addendum: Photos displayed here were taken when conditions permitted Alan to take his hands off the paddle – so sorry, no shots of yours truly going for a swim.